We need to see that report on glyphosate that you promised we would have before the spray season begins. We need to see that report now. It is not clear to us if your report has been scrapped, suppressed, or something else has happened. Dr. Russell, the spray season is upon us. Both CN Rail and NB Power have already publicly released their approved spray plans. Timber industries have already compiled their lists of acreage they want to spray for their monoculture conifer plantations. Their applications for taxpayer-financed provincial silviculture spraying are being reviewed, and they anticipate approvals within the next few weeks. We remember all too well how the government of that day tried to bury Dr. Cleary’s report on fracking in 2012. They knew they could not “control” her when it came to matters of public health, and they knew the report did not agree with their stated view that fracking is perfectly safe and would be great for NB. A similar situation potentially exists with this matter because in recent weeks, Minister Denis Landry and Premier Brian Gallant have both said glyphosate is safe. On May 18th, I and eleven other New Brunswickers hand-delivered a formal complaint to the New Brunswick Ombudsman. It addresses matters pertaining to the “no cause” termination of the former Chief Medical Officer of Health (CMOH), Dr. Eilish Cleary. Our major concern is the status of Dr. Cleary’s promise to investigate and report re: the risks of glyphosate herbicide compounds on population and environmental health. Our conversation with NB Ombudsman Charles Murray is ongoing. During her exemplary tenure as CMOH, Dr. Cleary established a very high standard for independent and comprehensive research, both with her peer-acclaimed 2012 report on population impacts of shale gas development, and in the Health Impact Assessments model developed in 2015 for the NB Commission on Hydraulic Fracturing. Since we learned that Dr. Cleary was put on leave and then dismissed, I am only one of thousands of New Brunswickers who are concerned that we will not see a comprehensive and independent report from the Office of the CMOH on glyphosate herbicide spray use in our province. any further protections needed to protect the population in New Brunswick would be independently developed and not curtailed by Health Canada’s Pest Management Regulatory Agency conclusions. regarding when we could expect the report: “it is our understanding that its use is seasonal so we do not expect any significant spraying between now and the summer of 2016. We anticipate completing our action plan in advance of the next spraying season.” Subsequently, in a communication to Dr. Caroline Lubbedarcy, you promised the report this Spring. Dr. Cleary’s impending and then actual dismissal broke in the media in early December 2015. At that time, the Deputy Minister of Health, the Minister of Health, and the Premier all affirmed that this report was forthcoming as originally promised. Spring is over, and the spray season has begun. Where is the report? I am sure you are aware that new research is coming out all the time on these herbicide compounds. A literature review by 14 diverse scientists called Concerns over use of glyphosate-based herbicides and risks associated with exposures: a consensus statement, was published in the peer-reviewed journal Environment Health on February 17, 2016. You will find the content in the appendices especially alarming. Other research suggests that glyphosate on its own is not nearly as bad as the complex herbicide formulation, glyphosate PLUS additives and adjutants, that make it work and are protected as “trade secrets.” As I understand it, these additional substances are what carry the glyphosate across cell walls and increase the hazards by untold magnitudes in a multitude of ways. Of huge concern to scientists studying glyphosate is that its use is so widespread: people’s exposures to the residue are pandemic, and tests show high concentrations in humans. I am sure you are also aware that a 2001 Supreme Court of Canada decision affirmed government has a rightful mandate to apply the “precautionary principle” on the directly related matter of pesticides. The Consensus Statement referenced above clearly advocates for caution and care, and is part of the reason we are convinced that the precautionary principle must be applied to use of glyphosate here in New Brunswick. The precautionary principle can be understood as: first, do no harm; and, second, avoid doing things when there is a reasonable likelihood this could cause harm. The principle applies until the safety of the matter in question can be established. Thousands and thousands of New Brunswickers share the concerns I have penned on behalf of our Kent County NB Chapter of the Council of Canadians. Valid population and environmental health research of the risks associated with these compounds is urgently needed. We sincerely hope that the report you have been working on will meet the tests for being valid, in depth and independent. Please send me the report that we are promised. On March 2, 2016, 17 member groups in the New Brunswick Environment Network (NBEN) attended a 1.5 hours meeting with Brian Kenny, Minister of the Environment for New Brunswick, and three of his senior staff. Thank you to NBEN’s Mary Ann Coleman and Raissa Marks for organizing this opportunity for an exchange of information and issues. Major items discussed included: how “regional planning” might help with environmental protection (eg. through increased mandates to the regional service district committees); water protection legislation – including wetlands, and enforcement of riparian buffer regulations; the Environmental Trust Fund; and, the urgency of climate action and moving on to renewables. Concurrent with all that is making the department’s work more transparent, and various digital information enhancements that are already underway. While looking at this list, it is important to remember that Brian Kenny is Minister for the Environment AND Local Government (one department). On reflection, it appears that they are putting their eggs in the basket of local government as their approach to improving protection of the environment. An interesting idea – not adequate certainly, but might well help if done properly. A lot can be accomplished through land use planning tools if used properly. So folks, if you want to make a point on municipal or regional planning systems, policies, issues, concerns, etc. — now’s the time! I took this photo so am not in it. That’s the Minister at the head table, on the left in front of the screen. I attended on behalf of the Kent County Chapter of the Council of Canadians. As always, when I have the chance to speak truth to power, I think about which of my closest allies are not “At this Table,” and what they might like me to communicate that seems appropriate to the situation. Here is a picture of me and my confrere Mark D’Arcy who attended on behalf of the Fredericton Chapter of the Council of Canadians. Mark used his allotted time to speak about climate change issues and the need for the Government of New Brunswick to do its own EIA on the Pipeline proposal. Mark strongly emphasized the Minister’s Duty of Care in regards to the possibly serious, even lethal, risks related to both these issues. This photo was taken by Caroline Lubbedarcy, who represented Stop Spraying in New Brunswick, and used her alloted time to press for a full review of health and environmental hazards of herbicide spraying by forestry companies and NB Power, as well as an end to the spraying. It is also important to mention Jim Emberger was present, speaking on behalf of the New Brunswick Anti-Shale Gas Alliance. He addressed many of the points included in NBASGA’s Statement on the New Brunswick Commission on Hydraulic Fracturing Report, including the lack of social license, the science case against fracking, and the urgency of NB government undertaking nation-to-nation relationship-building with First Nations . Later in the meeting, Jim spoke about the importance of government recognizing that each region of the province is very different, something he has learned through NBASGA. Unfortunately, none of our Indigenous environmental protection allies were present. For me, a smudge and a reading of the Declaration of the Rights of Mother Earth would have been a welcome addition. Next time? “Another example of that betrayal connects to something that was discussed at the outset of this meeting today. Our Kent Regional District Service Commission passed resolutions unanimously opposing the new Forestry Management Act, and opposing Shale Gas Fracking Exploration in Kent County (actual vote 15-1 abstention, I believe). But, Mr. Minister, as you know, there is no systemic pathway for resolutions from the Service Districts into the government here in Fredericton. The fact that the Government of New Brunswick totally ignored the only local body that represents our municipalities and local service districts contributed mightily to our sense that government deserted us to our fate of being a “Sacrifice Zone” for resource extraction industries. “I am going to assume that you, Mr. Minister, and your three staff at the head table, have children, grandchildren, nieces, nephews, perhaps godchildren… When thinking about the future they will face, it is clear and evident that your Ministry is the most important department in the Government of New Brunswick. “At the core of your mandate is ensuring environmental sustainability in this province we all love. You have the tools and responsibilities for all manner of impact assessment, regulatory powers, inspection and enforcement services, in order to protect our environment. There is a huge urgency to bring all these into active service due to the ecoapocolypse that is lurking over our shoulders due to our rapidly deteriorating, changing climate. We love our Acadian Forest, and all its inhabitants. We want our Forest Relations to survive and thrive. This means stopping the rapacious clear-cutting, the softwood plantations, and the spraying of poisonous herbicides. We want water protection legislation for our fresh drinking water, our inland fisheries, and our precious wetlands. We want shale gas mothballed for the long term by legislation. Your department’s mandate re: “impact” and “sustainability” strengthen your hand at arguing this in cabinet. We are passionate about biodiversity. The diversity of wildlife in our region — the forests, the waters, and the soils — contributes directly to the livelihoods of virtually everyone in Kent County, all the way down in scale to the bees we rely on to pollinate our fruits and vegetables in our gardens — so take a look at the neonicotinoids as well, please. We fully support implementation of the Health Impact Assessment (HIA) process, proposed by the former Chief Medical Officer of Health Dr. Eilish Cleary to the NB Fracking Commission. The Commission endorsed this approach but in an inappropriate and ineffectual manner. An HIA trumps an EIA, and as Dr. Cleary pointed out, the current EIA processes will and can be addressed and included within the broader scope of the HIA process she outlined. This is what we want to see. It will begin to restore our confidence that government is capable of looking after us over here in Kent County. “On behalf of our group, the Kent County Chapter of the Council of Canadians, and all our united Mi’kmaq, Acadian and Anglo environmentalist allies in Kent County, I beg that you hear what I am saying. There is no time to lose on these matters. Please instruct your staff to walk into all interdepartmental meetings — and you, please,Minister Kenny, walk into all Cabinet meetings — with your heads held high, insisting on full implementation of the environmental protections your broad mandate offers. ∗ See for example: “Powerless Citizen” and “Illusion of Certainty”, Some of the Human Rights Issues Related to Fracking , Lise Johnson’s Story, No Shale…, Kent County Chapter Council of Canadians, Notre environnement, notre choix / Our Environment, Our Choice, Yvon Daigle’s Submission to the Commission, The Requirement to be Informed, It’s about Trust, To Make Critical Decisions, We Must Employ Critical Thinking, Personal Submission to the Shale Gas Commission, Groupe de développement durable du Pays de Cocagne Sustainable Development Groupe. Question: is there a Conflict of Interest in the NB Commission on Hydro-Fracking? A man named Andrew McLaughlin was recently hired by Major Drilling. According to their website, Major Drilling “is one of the world’s largest drilling services companies primarily serving the mining industry,” and “provides all types of drilling services including surface and underground coring, directional, reverse circulation, sonic, geotechnical, environmental, water-well, coal-bed methane and shallow gas.” Sounds like this Andrew McLaughlin is closely associated with deep shale fracking operations. Here’s the question: is Andrew the son (or other close relation) of John McLaughlin, the man who is the Chair of the NB Commission on Hydraulic Fracturing? Someone told me Andy is John’s boy. Mind you, I did not want to believe that Premier Brian Gallant’s Fracking Commission could be skewed in favour of the fracking industry, who are known for their “drill, baby, drill” practices because that is the only way to make deep shale extraction possible. So, what’s the scoop on this? For starters, Francis’ debacle on the NB Power sell-off issue makes it clear the man has no idea about the significance of “social license.” Now, he is not in government any longer, so a person might say he does not need to be concerned with social license issues, UNLESS he is flouting the integrity of the NB Fracking Commission by hiring someone who can use family connections to make sure the Commission comes up with the recommendation to proceed with fracking. Here are the questions: Assuming for a moment that Andrew IS John’s son, and I have no way of knowing this for sure but someone told me he is, then which came first: the chicken or the egg? Did Andrew get hired by Major Drilling to sway the Fracking Commission, or did Andrew know the Fracking Commission will recommend lifting the Moratorium so he took this job to be in the right place at the right time? Or both perhaps? Frank McKenna, former Premier of our province, is a huge booster of fracking in New Brunswick. Frank is also buddy-buddy close with Francis McGuire. Here are the facts on the matter of whether those of us who oppose fracking are a minority. In all surveys done to date and released to the public, our province’s population is split just about 50-50 on the simple topic of shale gas extraction industrial development. However, as soon as the question is complicated with balancing this development against the priority of protecting our environment, the environment has won in all public opinion surveys. In one memorable one during the Alward government, more than 80% of the population said they would not support shale gas development if it could negatively affect the natural environment. We all know it is absolutely impossible to “do” shale gas without damaging the environment. Here are the questions: Is Frank patient now because he knows his crony Old Boys network already has the fix in? Does this seem like a logical conclusion for Frank to reach, because of the direct line between Frank and Francis at Major Drilling, especially as it seems that Andrew may be the son of NB Fracking Commission Chair John? Or is there some other reason Frank all of a sudden feels the Fracking Commission is doing a fine job? The thing is, the Government of New Brunswick (GNB) just took a gigantic step backwards on gaining social license for any industrial activities that could have or will have negative impacts on health and environment. In December, GNB fired for “no cause” the one person in the entire civil service that the medical community and grassroots communities knew we could trust to speak the truth about whether provincial policies were good for people and the environment that sustains us. I am speaking of our former exemplary Chief Medical Officer of Health, Dr. Eilish Cleary. So, like many others, I am in a state of hyper-vigilance about what GNB has up their sleeves next. Here are the questions: given the obvious pro-fracking standpoint of Major Drilling can the Government of New Brunswick set to rest the questions that are floating around right now, about whether Andrew McLaughlin may or may not be directed related to the Commission’s Chair John McLaughlin? If this suggested malfeasance is indeed true, can the Fracking Commission Chair explain how this is compatible with the Commission’s online Code of Conduct? Is this perhaps a true conflict of interest? Was it declared? If it was declared, where and when? And even if it was declared, does that make it right? deep distrust of GNB, and would be one more nail in the coffin of social license. TO: Develop a Legal Strategy to Make the Government of NB Send Home the Texas Frackers and PROTECT ATLANTIC REGION for future generations. 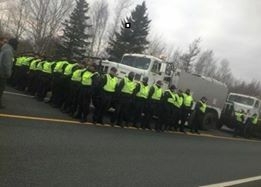 “Catch and Release” is fishing terminology but also describes an RCMP tactic for intimidating anti-shale gas protesters and environmental protectors in New Brunswick. 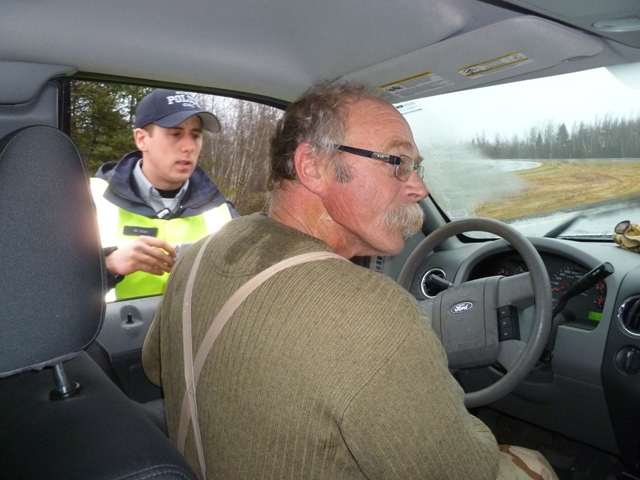 On November 29th, an older Acadian man standing alone with a placard was arrested and then released without charge. An independent journalist experienced this three separate times. In one memorable incident, a Mi’kmaq spiritual leader from the Elsipogtog First Nation peacefully protested dressed as Santa, and was arrested, detained, and then released without charge. These are not isolated examples of abuse of process as will become clear below. Four years ago, the Government of New Brunswick (NB) granted licenses for the exploration and testing for shale gas deposits on 1.4 million hectares of Crown Land, as well as various privately owned lands. The largest lease-holder is SWN Resources Canada (SWN), a wholly owned subsidiary of Texas-based Southwestern Energy. Throughout 2011 until now, New Brunswickers (NBers) from all walks of life have been urging the Government of New Brunswick to not allow unconventional hydraulic fracturing (“fracking”), through petitions, lobbying, protests, public information sessions, etc. With the emergence of the Idle No More movement a year ago, the Mikmaq People – especially those from Elsipogtog First Nation — got on board with this anti-fracking opposition in a BIG way. People, including NB’s own Chief Medical Officer of Health, are concerned about the links between fracking and pollution of water, land and air, and its potential impact on natural habitat and human health. The other huge issue is the lack of consent by NBers to proceed with extreme shale gas extraction, especially the Indigenous people of the province, who never ceded their original territory in the pre-Confederation Peace & Friendship Treaties. Regardless, the NB government’s enthusiasm for fracking has continued unabated. Fast forward to early June 2013, when SWN began seismic testing for shale gas deposits in Kent County (c. 50 km north of Moncton). Ignored by their own provincial government, Acadian and English-speaking allies rallied behind the Mi’kmaq in a unique grassroots alliance to protect the Signigtog District of Mi’kmak’i. As SWN moved around Kent County, several “Unity Camps” were established on properties volunteered by area residents. After facing stiff resistance, SWN temporarily ceased testing in late July with only about 40% of their planned work program complete. When SWN returned in September, the “Rexton” or “Route 134” camp was set up. Demonstrations resumed, this time including a road blockade. 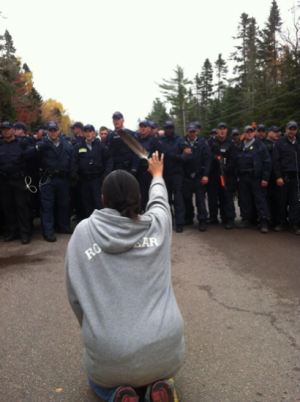 For almost three weeks, the RCMP showed restraint, and the protest remained peaceful. 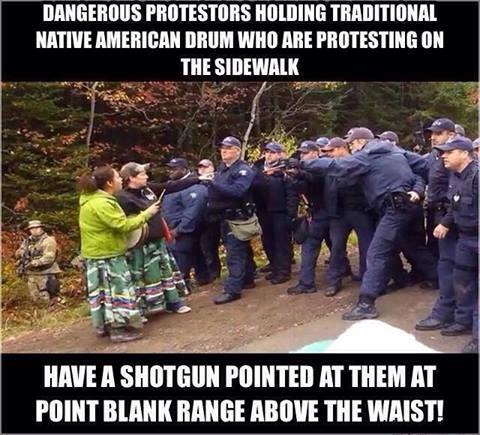 RCMP changed tactics at dawn on October 17th. Hundreds of heavily armed officers raided the camp, citing as pretext the need to enforce a civil injunction by the SWN corporation against several demonstrators plus unsubstantiated information that the protest had become dangerous. Native and non-Native area residents opposed to fracking rushed to the scene. In the ensuing melee, a phalanx of various police officers (perhaps from more than just the RCMP) deployed flash bombs, fired bean bag bullets and sprayed pepper spray directly into the faces of people, including elderly people and even children. 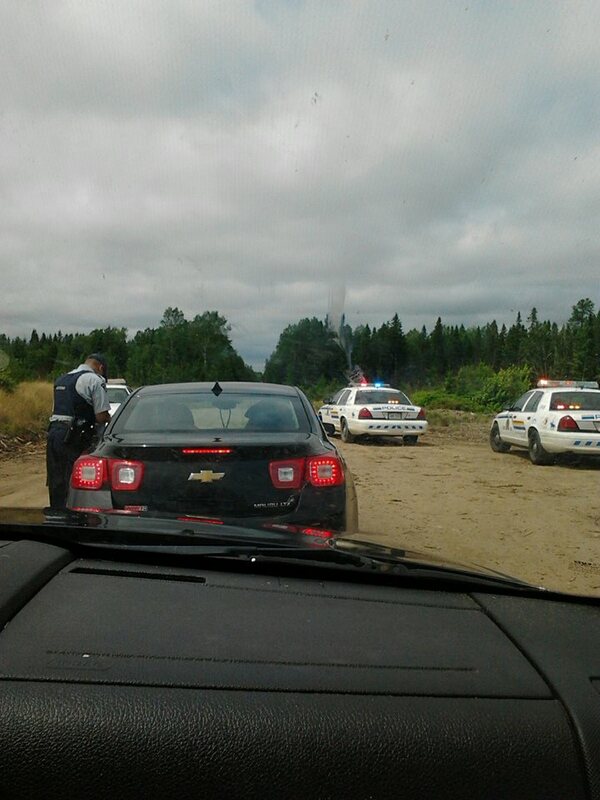 The news reports you have all seen (the burning police cars) neglected to mention that the Mi’kmaq Warriors providing protest security were arrested several hours earlier. Questions remain about who started these fires, as well as police claims about weapons being used by the protestors. Fifteen people (Native and non-Native) are being sued by SWN for economic loss in what is often colloquially called a Strategic Lawsuit Against Public Participation (SLAPP). In conjunction with their civil actions, SWN was also granted two injunctions, dated October 3 and November 22. Both injunctions also name “John Doe” and “Jane Doe.” The latter injunction restricted anyone in NB not employed by SWN (by virtue of “John and Jane Doe”) from being within 250 metres of company equipment and/or personnel. SWN has finally left NB with perhaps 50% of their planned 2013 work programme complete. They say they will return and indeed are being welcomed back by NB Premier David Alward. those named in the SWN lawsuits. A number of relevant background documents and additional links can be viewed elsewhere on this blogspace.